An established, fast-growing, well-funded stealth mode start-up based in Tel-Aviv Rothchild area, specializing in mobile applications. We were founded by experienced serial entrepreneurs and are extremely passionate about developing mobile products to consumers. Our team has a few dozens of technology savvy engineers and code geeks that help us bring to life our mobile offering for Android, iOS, Web and Server Side solutions. We are leaders in digital innovation, armed with a portfolio of patents and have a track record of bringing ideas to life. Join us and make things happen! 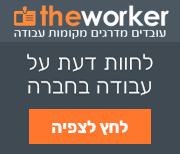 We are a growing family startup in Tel-Aviv, specializing in mobile applications in the communication industry. We already have over a million users and we’re growing tremendously fast! We are looking for highly ambitious, self-motivated people to join out winners team! Experience testing mobile and desktop applications. Tech Ops - 1st technological role at our startup! We are looking for talented fresh graduates with a BSC in Computer Science/Software Engineering/IDF’s technological units - who live, breath and LOVE technology, gadgets and mobile applications. Note: The aimed career path is to be integrated into one of our development departments. The role includes: Quality Assurance, Tech Support, Product, Content / Knowledge Writing and Script Programming. You will work closely with R&D, Product Management and Marketing departments. The role will give you an opportunity to get to know the different aspects of the software industry while connecting the company to our users. The ideal candidate is a “PC Wizkid”, code geek, passionate about everything mobile, likes to break and put together things (each one separately or all together). Ability to work under pressure, flexible working hours, development experience, SQL/Data Base working experience, prior experience as a programmer / QA / support / automation / IT / engineering. You will be using modern languages and frameworks to integrate and build systems and infrastructure.